With Father’s Day just 10 days away (better go tie-shopping now), it’s the perfect time to honor all the great dads of the internet. 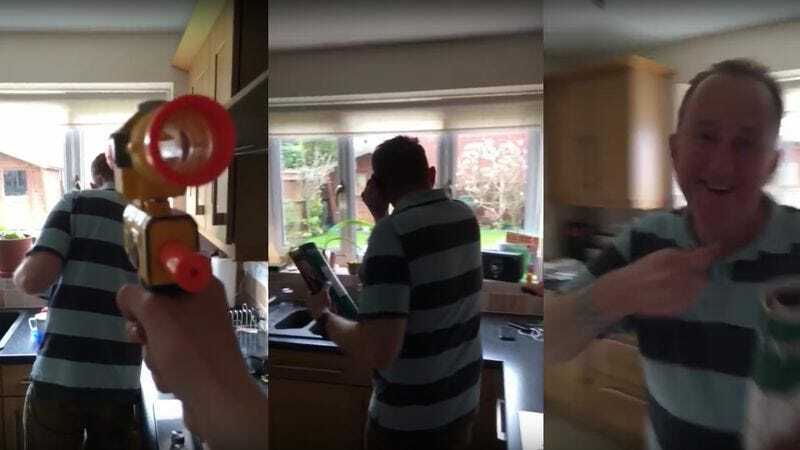 One candidate is an unnamed U.K. man whose prankish son, Tom, regularly shoots him with a Nerf gun and films it with a smartphone so the humiliation may be shared with the world. Tom, who goes by the catchy handle XxxJOKRSKOPRxxX on YouTube, has now uploaded a highlight reel of his greatest Nerf hits. It’s a minute of pure, gleeful malevolence, a rather more benign version of the elaborate abuse that Jackass prankster Bam Margera used to heap upon his own benighted father, Phil. What’s remarkable here is how relatively sanguine Tom’s father is about all of this. He shakes his fist at the camera a little and refers to his son as a “prick,” a “bugger,” and a “silly sod.” But that’s about it. Generally, his reaction is to laugh it off, which only encourages Tom to continue. Funny as this material is on its own, it offers incredible remix potential. Since it is always filmed from the son’s perspective, it looks a bit like a first-person shooter. There are overtones here, too, of the iconic “gun barrel” sequence from all those James Bond films—all that is ever seen of Tom is his hand holding the Nerf gun. For this to work, there might have to be at least one video in which the father shoots back, just the way Bond does. Or maybe here, 007 just gets caught off-guard and lets out an “OOF!” while wincing at his assassin. Lastly, the fact that the son frequently has to sneak up on his father before attacking him seems to all but cry out for John Williams’ Jaws theme. Just a thought.